Powerful Honda GX Engine:Easy starting and a powerful, commercial performance is available with the 13 HP/393cc engine with mechanical decompression for maximum leaf blowing ability. 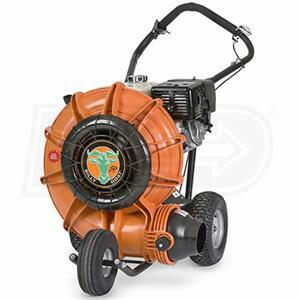 Advanced 17 inch Fan:Consistent airflow is enhanced by the 17 inch, 16 blade closed fan that offers twice as many blades as other blowers on the market. Patented Aim N Shoot™:Quickly lower or raise the discharge chute with a convenient airflow control lever located near the operator’s position. More force will be directed down to the blow up and under heavy piles of leaves and debris, the closer the chute is to the ground. Air Volume & Speed:Productivity and operation is increased with 6.2X the air volume of backpack blowers and air speed reaching almost 200 mph. Smooth Rounded Housing:A smooth rounded design eliminates air voids, reduces noise, and increases output efficiency, unlike bent metal housings. Also, weight is decreased up to 30% for less effort when pushing. Improved Forward Chute:Blow along retaining walls, fences, houses, or property lines with the improved soft rubber forward chute that’s easy to install with snap on features. Quiet Operation:Make your neighbors or your clients neighbors happy with a quieter operation than steel or backpack blowers. Ergonomic Padded Handles:Comfort for long working hours is provided with the ergonomic padded handles and reduced vibrations from the tubular frame. Large Rear Wheels:Reduce resistance over grass and tread quickly over tough terrain with the 13 X 5 inch large tires.